Magnets of appropriate design direct the lifting forces into the material in controlled amounts over large areas. On the one hand, this prevents pressure marks, dented edges and impaired plate quality. On the other hand, it enables any quantity of material to be moved efficiently, flexibly and safely by remote control. But the list of cost savings does not end there:- Wearing parts such as chains, ropes and belts are no longer required. Magnet systems need little maintenance and enjoy a long working life. Infinite control of the lifting power on TRUNINGER magnet systems means it is possible to separate even thin sheets. It allows you to pick exactly the number of sheets you want or to distribute a sheet stack among several storage locations. 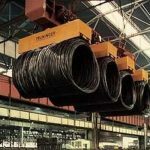 Steel distributors, for example, can use the system, in conjunction with a crane weight scale, for direct order picking. Safety is not only a question of backup batteries and controls. Sagging is particularly severe on thin sheets. 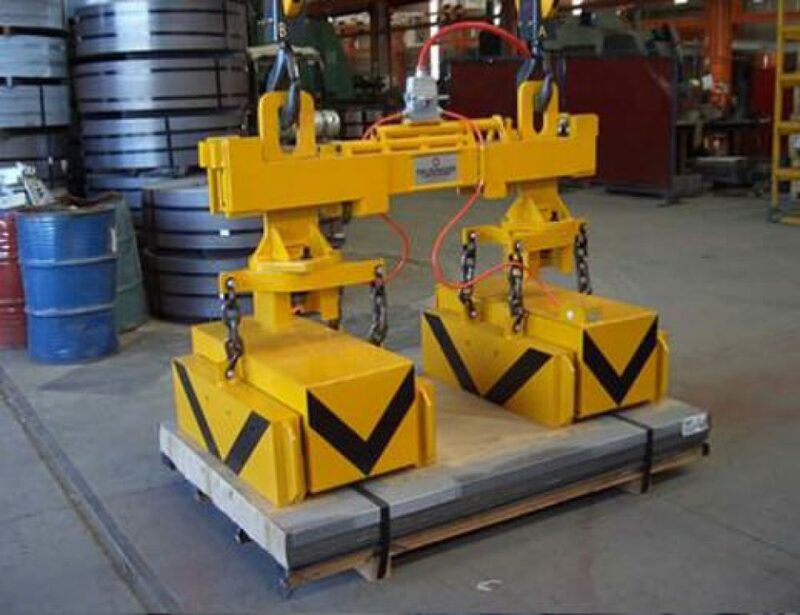 Hence the magnet system has to be equipped with a sufficient number of magnets, correctly distributed, to prevent unacceptable degrees of sag, imperative to safe and efficient handling. Of course, the same system can be used to transport sheet packs as well as single sheets [See Photo 3]. Far larger quantities can be handled per cycle in packs as opposed to loose stacks, because it is not necessary for all the sheets to be reached by the magnetic field. Some of the sheets in thick packs are carried by the strapping, which must be adequate. With various adjustment options the magnet system can be adapted to diverse user requirements. Motor driven adjustment of the magnet spacings, allow optimum positioning of the magnets for the lengths of product being handled. Slewing gears also enable the products to be aligned onto a lorry or into storage locations, exactly as required. 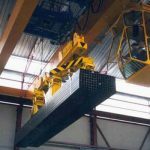 A particularly light-weight and flexible solution is formed by two magnet groups, each on an independent hoist with two-rope pulley [See Photo 1]. A rotary crab on the crane – as opposed to a slewing gear on the spreader beam – reduces weight further still. It is possible to vary not only the distance between the magnet groups but also the distance between the magnets. Turning the magnets through 90° allows the handling of tubes and bars, with the same system. A very interesting development from TRUNINGER is the magnet lifting equipment for vertically racked plates [See Photo 2]. For highly diversified stores they can be a space-saving alternative to horizontal sheet storage. With the same system, it is possible to pick up sheets from either horizontal or vertical positions and to put them down again as required.